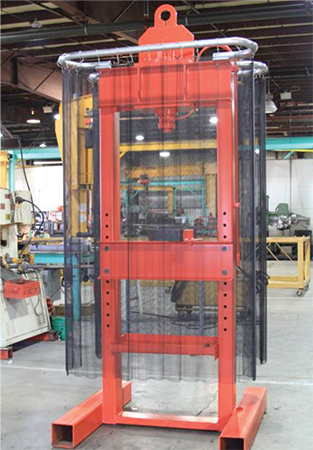 Ejection-curtain guarding kits for hydraulic presses, from Rockford Systems LLC, are designed to prevent injuries caused by flying, rolling or sliding debris. The kits, featuring coiled wire-fabric machine guards, meet the ANSI B11.2 ref 8.2.1. “flying objects” clause, pending results of a risk assessment to determine the likelihood and force potential for throwing objects. The guards can be opened easily to load and inspect a part, and then closed and secured during press operation. And, the 19-gauge-steel coiled wire-fabric guards allow visibility of the machine process without sacrificing operator safety. The fireproof, corrosion-resistant kits come in three standard sizes—40.5, 42.75 and 51 in.—that fit most hydraulic presses, with custom sizes available.